The standard GeneratePress menu will cause residual styling and significant interference with UberMenu. The theme is nice and flexible, however, and provides a pluggable function that we can add to a child theme to easily replace the theme’s default menu. This guide will walk you through integrating the menu manually to replace the theme’s menu, then configuring the menu to align with the theme in the settings. You can choose to integrate via a child theme or a code snippet. The first function overrides the theme’s menu. The second part stops the theme from running a filter that adds an extra element to items with dropdowns, because the theme does not check that it is only adding this to its own menus. That’s it, we’ve now overridden the theme’s menu. 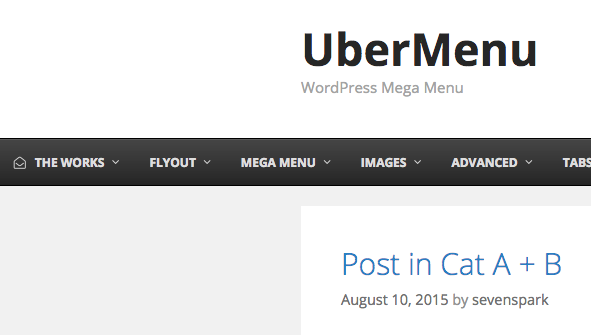 If you uninstall UberMenu in the future, remember to remove this code to revert to the theme menu. The result of the manual integration will be that the menu will appear full-width on your site. To center the menu, in the UberMenu Control Panel, enable the Center Inner Menu setting and set the Inner Menu Width to 1100px.